1) The Club Calendar and Entry form for Botvinnik Swiss indicates that there is no club this week Friday. This is incorrect. We will be having Round 3 this week Friday. Same place, same time (18h30 start). 2) All rounds for the Botvinnik Swiss will now be 1 week in advance. There will not be any free Fridays during this tournament. 3) Remember to please tell me by Friday 12pm latest on the day of the round, that you will not be playing. 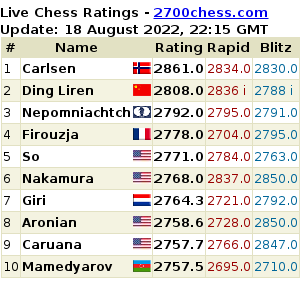 Once the pairings are published on chess-results.com they will not change. 4) Reminder to all players that have outstanding membership fees to please pay. Latest is to pay at club this week Friday. Failure to do so will see you removed from the tournament and future Glenwood Chess Club tournaments until you have paid.